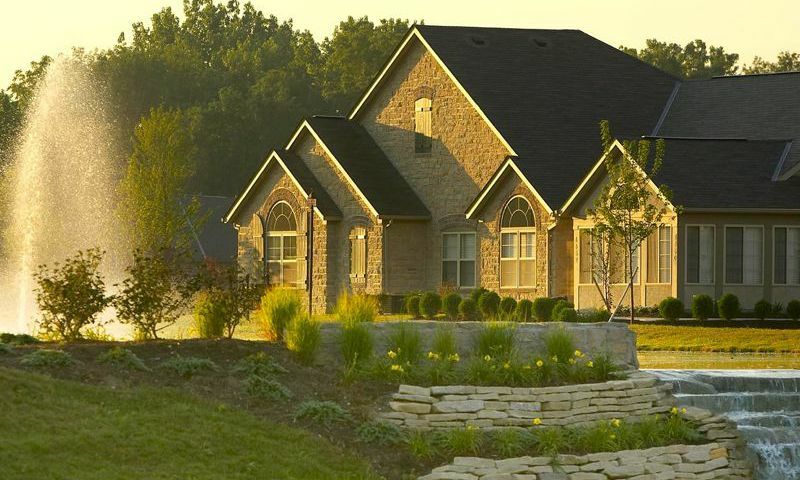 Crossings at Clifton Estates is an active lifestyle community located in Circleville, Ohio. Homebuyers can enjoy maintenance-free residences in a quiet neighborhood setting of only 106 attached homes. Crossings at Clifton Estates also provides charming amenities that cater to active adults and retirees. The clubhouse in Crossings at Clifton Estates is the central hub of social and physical activities. Residents can stay in shape by working out in the exercise room that’s equipped with cardiovascular and weight-training machines. Homeowners can enjoy social interaction with neighbors in the multi-purpose room or utilize the catering kitchen to prepare a snack for a small gathering. Residents delight in the great outdoor amenities as well. They can take a dip in the swimming pool during the warmer months of the year or hang out on the patio. Epcon Communities began construction of Crossings at Clifton Estates in 2004. The community will consist of 106 attached homes upon completion. Homebuyers can choose from two distinct floor plans: Abbey and Canterbury. Both models offer spacious layouts, single-story living, gourmet kitchens, and plenty of closet space. The Abbey model offers 1,716 square feet of living space with two bedrooms, two bathrooms, and an attached two-car garage. The Canterbury model offers 1,861 square feet of living space with two bedrooms, a den, two bathrooms, and an attached two-car garage. Residents in Crossings at Clifton Estates enjoy living a low-maintenance lifestyle. Thanks to the homeowners’ association (HOA), a reasonable fee covers lawn care, water, sewer, trash collection, and snow removal. Residents can leave the hassles of exterior-home maintenance to the HOA and pursue hobbies or fun activities in their free time. Ideally situated in Pickaway County, residents in Crossings at Clifton Estates are close to major roads and everyday conveniences. Routes 22 and 23 are easily accessible and the YMCA Pickaway County Branch as well as other restaurants and shops are only a few minutes away. Outdoor lovers can head a few miles down the road to A.W. Marion State Park for recreational activities such as boating, fishing, hunting, swimming, and picknicking. Homeowners can visit Columbus for big-city attractions or catch a flight at Port Columbus International Airport, which is about 43 minutes away. Buyers seeking a quiet community setting close to many attractions will love calling Crossings at Clifton Estates their home in Circleville, Ohio. Check back soon for more information on the lifestyle in Crossings at Clifton Estates. The Abbey model offers 1,716 square feet of living space with two bedrooms, two bathrooms, and an attached two-car garage. The Canterbury floor plan offers 1,861 square feet of living space with two bedrooms, a den, two bathrooms, and an attached two-car garage. Both models offer spacious layouts, single-story living, gourmet kitchens, and plenty of closet space. 55places.com is not affiliated with the developer(s) or homeowners association of Crossings at Clifton Estates. The information you submit is distributed to a 55places.com Partner Agent, who is a licensed real estate agent. The information regarding Crossings at Clifton Estates has not been verified or approved by the developer or homeowners association. Please verify all information prior to purchasing. 55places.com is not responsible for any errors regarding the information displayed on this website.